I couldn't imagine how big and scary these beasts are! I expected a big musk rat but he was more like a capibara! Beavers appeared here only a few years ago. 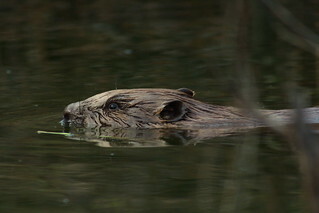 Well, honestly I didn't expect to see a beaver there at all, because their dam is so close to summer houses and I thought beavers would be way more cautious with so many not-so-friendly people around... or was it my realtree camo outfit? This guy surfaced about 5 m from me while I was sitting near a beaver pond, stared at me for a while and then dove with a giant splash. It was very late so I'm quite happy with these photos (uncropped, btw).